Can’t remember when your event at the LGBT Center of Raleigh starts? Consult this App to see the latest information from the Center’s Events Calendar without having to visit the website. Links are provided for more information on the event’s individual listing. Optionally, you may add the event to your personal calendar and setup reminder notifications. In addition, many of our partner organizations list their events on the Center’s Events Calendar as well. Contact our Web Team for information about how your Community Organization can promote its events here. Consult the Community Resources page while you are already out and about. Use the links and information to learn more. Some phones allow you to load your dialer with phone numbers and launch your mapping app. Use the Mental Health Resources app to show only the providers in your area who can help you or a loved one. The filter feature is only available on this app. Plus, emergency phone numbers are just one tap away. Find an Affirming Faith Group quickly and go to its website for more information. Begin your Sustain Your Center recurring contribution with just a few taps. Access the LGBT Center of Raleigh Website on the go. This app uses current information directly from the LGBT Center of Raleigh site’s top 4 web pages. It’s fast and reliable. 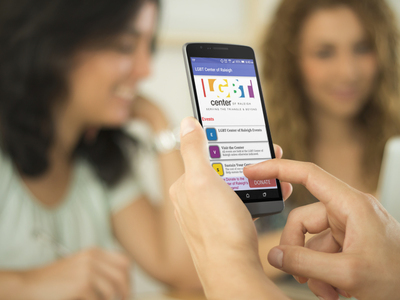 As with all programs and initiatives of the Center, this FREE App is made possible because of your generous, recurring donations to the LGBT Center of Raleigh. Please donate today! And please visit the businesses and organizations who directly sponsor this app by tapping on the small banner at the bottom of the screen. Thank you! Apple, the Apple logo, Apple TV, Apple Watch, iPad, iPhone, iPod, iPod touch, iTunes, the iTunes logo, Mac, and QuickTime are trademarks of Apple Inc., registered in the U.S. and other countries. Multi-Touch is a trademark of Apple Inc. App Store is a service mark of Apple Inc., registered in the U.S. and other countries. IOS is a trademark or registered trademark of Cisco in the U.S. and other countries and is used under license. Other product and company names mentioned herein may be trademarks of their respective companies.